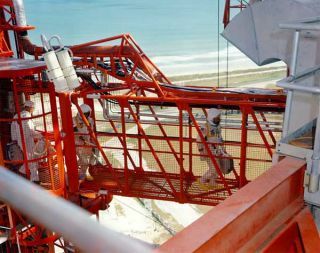 Apollo 1 crew members walk across a catwalk to the Launch Pad 34 White Room on January 27, 1967. Forty years ago today, Stephen B. Clemmons was assigned to Launch Complex 34 at Cape Canaveral, Florida. The events that would unfold on Jan. 27, 1967, would forever change the course of the United States' space program and Clemmons' life. The crew of the first Apollo mission, scheduled to launch on February 21, 1967, were at the pad to run a test inside the spacecraft that would take them to orbit, kick starting the nation's efforts to land a man on the Moon before the Soviets. With less than three years left in the decade set by the late President John F. Kennedy to accomplish the lunar landing, NASA was under pressure to launch Apollo 1. Virgil 'Gus' Grissom, Edward White and Roger Chaffee were already strapped and sealed inside Apollo 204 for a "plugs-out" test when Clemmons arrived at Pad 34 image]. collectSPACE.com spoke with Clemmons about that ill-fated January day. collectSPACE (cS): What brought you to be on Pad 34 on January 27, 1967? Who was there with you? Stephen Clemmons (SC): I worked as a spacecraft mechanical technician for North American Aviation, the builders of the Apollo spacecraft. I was assigned to the second shift ground support crew working for Carl Black, supervisor, and James Gleaves, leadman, for the upcoming AS-204 flight, with Gus Grissom, Ed White and Roger Chaffee who were inside the craft with all the hatches secured. The only part of the mechanical crew that night still on station was Jerry Hawkins, Gleaves and I. Everyone else had left at 5:45 that evening for dinner and would return at 6:30. On every ground test on our shift that involved a flight crew and NASA, an engineer named Donald Babbitt served as the North American Aviation (NAA) pad leader directing the NAA operations at the pad level. He was the only one who could talk to the NASA Test Conductor as "XPAD" over the communication channels and was our only connection to the blockhouse. We were working on level seven and eight, at the 160 to 180 foot level of the Pad 34 tower. The astronauts had been aboard since 1:00 p.m. that afternoon and NASA was in total control of the operations. cS: Why were the astronauts there? What was the nature of the test? SC: This was to be the last major test of the spacecraft called the "Plugs Out Test," which would simulate the liftoff of the spacecraft during an actual launch. The umbilicals, the only connection between the spacecraft and the ground control systems would jettison or drop away from the spacecraft, cutting off all ground control signals and the spacecraft would go on it's own internal power and control systems. cS: What was happening as you came on-shift? SC: We had reached the point in the procedure where we were ready to jettison the umbilicals. A hold (or stop) was called to resolve some communication problems and straighten out some procedural problems. I was now monitoring the oxygen panel that was supplying pure oxygen to the spacecraft's environmental control system (ECS). We expected to pick up and resume the count at 6:30 p.m. and for the first time that evening, we would get involved in the test by catching the umbilicals on level seven. Others would go to the White Room to wait on the emergency egress signal that would then come from Gus Grissom or Ed White. They would remove the outer hatches after Ed White had released them from the inside of the spacecraft. At 6:30, the test conductor announced that the count would resume in one minute. SC: There was a slight pause, we could hear some cross shatter in the blockhouse, then we heard, "We have a fire in here, get us out!" No one has really been able to tell what was said, it was followed by "there's a fire in here," then a few seconds later, we heard a piercing scream and then silence [image].